Why Is Six Flags Targeting Kids with a Creepy Old Guy? Things can't get much worse for many of the world's top luxury brands. This week Coach, the high-end handbag seller, announced that profits slumped 32% for the quarter. Same-store sales at Saks were down 23.2% in the first five months of this fiscal year. BMW's U.S. sales are off 28.9%. Bain & Company, the consulting firm, is forecasting a record 10% drop in the overall U.S. luxury market this year. According to Bain, luxury won't fully recover until 2012. What can these brands do to battle this malaise? 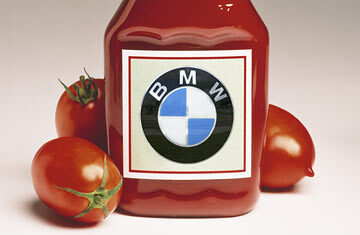 Maybe BMW should try selling ketchup or mayonnaise. It's not as ridiculous as it sounds: according to an upcoming study in the Journal of Consumer Psychology, recession-wracked shoppers are eager to embrace luxury brand names over a wide range of product categories, including those with little logical connection to the brand's core item. The authors attribute this phenomenon to the "promise of pleasure"  a brand like, say, Cartier evokes strong, positive emotional responses in consumers, and those good feelings can be easily transferred to stuff like furniture, cheese and even, yes, ketchup. "We were surprised with the results," says Vanessa Patrick, a marketing professor at the University of Houston and co-author of the study. "We didn't expect people to rate the luxury brand so high across such a wide range." So if the Ritz-Carlton sold chocolates, would consumers go for it? Says Patrick: "They could go there." To test their hypothesis that a luxury name carries weight across the board, the authors conducted three experiments. In the first, undergraduate subjects in Georgia were shown advertisements for a northeastern brand they didn't know, Prince Spaghetti Sauce, to prevent any inherent bias in the responses. The ad told one group that the spaghetti sauce was "luxurious." For another group, the ad said that Prince offered "value for your money." Each group rated the "luxury" and "value" spaghetti sauces favorably. But when the researchers then asked subjects how they'd feel if the Prince brand was applied to six other products  ketchup, wine, cheese, tablecloths, dinnerware and dishwashers  the responses were shockingly divergent. In each case, the group that was told Prince spaghetti sauce was a luxury item rated Prince significantly higher than those who were told it was a value brand. So Prince the cheapo spaghetti sauce is fine and functional for my dinner, but I won't get too excited about Prince dinnerware. Yet if luxury spaghetti sauce evokes a pleasurable response, why wouldn't I enjoy Prince tablecloths too? Pleasure is power. "You can get pleasure out of a can opener," says Henrik Hagtvedt, marketing professor at Boston College and the study's other co-author. In the second experiment, two sets of subjects drank mango lassi, a mango and dairy drink served in Indian restaurants. Though the beverage was identical for both groups, researchers told one group that Mangola, the fictional brand name given to the drink, was a luxury product. They told the other group that Mangola was a value brand. Again, each group gave Mangola similar ratings. Like in the first test, participants were then asked to evaluate Mangola brand extensions in unrelated products (furniture, hotels and cruises). Just like in the prior experiment, the luxury group scored each of these products significantly higher than the value group. For the third experiment, the researchers used packaging to distinguish a discount set of silverware from luxury spoons. The silverware, dubbed Terrace, was identical, but a black velvet container signaled luxury, while a cardboard container signaled value. These results replicated those from the prior two studies. Participants ranked both sets of packages the same, but those who got velvet ranked the brand higher for two unrelated product categories, cheese and a restaurant. The message for luxury-brand sellers, the researchers say, is to expand their brand portfolios to small extravagances. "The availability of Coach key chains or Gucci flip-flops allows consumers who are cutting back to re-experience the pleasure of consuming luxury without paying a fortune," says Patrick. During a downturn, it's easier to pay $10 for a nice bottle of ketchup than $60,000 for a sedan (although the ketchup doesn't handle as well). This leads to crucial caveat: if a brand expands to another category, it had better retain its luxury claim. If Cartier is going to license its name on cheese, it had better be damn good cheese, and it had better sell this cheese at exclusive, upscale stores. When Bulgari licensed its name to a hotel, it chose a luxury hotel. Hermès has weathered the recession in part by expanding into premium, yet relatively more affordable, accessories and fragrances. There's a danger in overdoing it, though. Pierre Cardin is the poster child for bad brand extension, according to the Harvard Business Review. "By 1988, it had granted more than 800 licenses in 94 countries, generating a $1 billion annual revenue stream  and profits plummeted," the authors wrote in a 2005 article called "How Not To Extend Your Luxury Brand." Once the Pierre Cardin name started appearing on weirdly unrelated products, such as baseball caps and cigarettes, its luxury status was lost. Companies should extend their brands cautiously. "A luxury brand can extend itself across luxury channels," says Burt Flickinger III, managing director of Strategic Resources Group, a retail-consulting company. "It's a lot tougher to go into food." With all due respect to ketchup, it doesn't carry the same cachet as a spanking-new luxury car. No matter how fancy your ketchup, a commodity is a commodity, and in the product universe, commodities are price-driven. But in these times, brands should take risks beyond just slashing prices. And besides, who wouldn't be curious to at least try spaghetti sauce from Saks?